My fave comfort food of all time is on the move -- literally!! 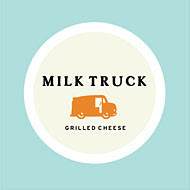 New York magazine reports that the Brooklyn Flea is unveiling a mouthwatering batch of new food vendors... including a grilled cheese stand called the Milk Truck, AND an innovative grilled cheese truck! How cool is that! The sandwich shop will open this month with the wheelie grilled cheese truck driving up in May or June. Now, the cheesy sandwiches on sale here will be somewhat special...not your run of the mill made-by-Mum type of grilled cheese (white bread, Kraft cheese slices with a dollop of ketchup on the side) that many of us (ME!) know and oh, so love. Nope, the fella in charge, Keith Klein, will be peddling posh cheeses, fancy breads and pricey mustards in his grilled cheeses. Still, the idea is fantastic! Makes a change from the pretzel and hot dog carts! the FIRST grilled cheese truck to hit the streets! Thanks for the tip, Dave.